The committee was created to advise the Secretary and the agricultural industry about efforts to combat serious pests and diseases that threaten the State's citrus crop. Most recently, for example, California's citrus growers are confronting the arrival of the Asian citrus psyllid, a tiny pest that can spread the fatal citrus disease huanglongbing. Weds. • 5/8/19 • CPDPC Meeting • 9:00 a.m.
Thurs. • 5/2/19 • Finance Subcommittee Meeting • 9:30 a.m.
Weds. • 5/1/19 • Operations Subcommittee Meeting • 9:00 a.m.
Weds. • 4/24/19 • Science and Technology Subcommittee Meeting • 1:00 p.m.
Weds. • 4/3/19 • Outreach Subcommittee Meeting • 1:00 p.m.
Weds. • 4/3/19 • Operations Subcommittee Meeting • 9:00 a.m.
Tue. • 4/2/19 • Finance Subcommittee Meeting • 10:00 a.m. 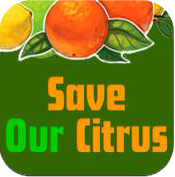 The SAVE OUR CITRUS app is a free iPhone application from the United States Department of Agriculture (USDA) that makes it easy to report and identify the four leading citrus diseases: citrus greening, citrus canker, citrus black spot and sweet orange scab. Report your symptoms, upload a photo and receive a response back from citrus experts.